Qing H. Liu received the Ph.D. degree in electrical engineering from the University of Illinois at Urbana-Champaign in 1989. His research interests have been in computational electromagnetics and acoustics, inverse problems, and their application in geophysics, nanophotonics, and biomedical imaging. He has published more than 300 refereed journal papers in these areas. He was a Research Assistant (September 1986 to December 1988) and then a Postdoctoral Research Associate (January 1989 to February 1990) in the Electromagnetics Laboratory at the University of Illinois at Urbana-Champaign. From 1990 to 1995 he was a Research Scientist and then Program Leader with Schlumberger-Doll Research, Ridgefield, CT. From 1996 to 1999 he as an Associate Professor at New Mexico State University. Since June 1999 he has been with Duke University in the Department of Electrical and Computer Engineering where he is now a Full Professor. 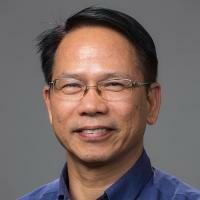 Dr. Liu serves as the founding Editor in Chief of the IEEE Journal on Multiscale and Multiphysics Computational Techniques (JMMCT), and an Editor for the Journal of Computational Acoustics. Dr. Liu received the 1996 Presidential Early Career Award for Scientists and Engneers (PECASE) from the White House National Science and Technology Council, the 1996 Early Career Research Award from the Environmental Protection Agency, and the 1997 CAREER Award from the National Science Foundation. He is a Fellow of the IEEE, the Acoustical Society of America, Electromagnetics Academy, and the Optical Society of America. He serves as the Distinguished Lecturer of the IEEE Antennas and Propagation Society for 2014-2016. Liu, H; Xia, H; Zhuang, M; Long, Z; Liu, C; Cui, J; Xu, B; Hu, Q; Liu, QH, Reverse time migration of acoustic waves for imaging based defects detection for concrete and CFST structures, Mechanical Systems and Signal Processing, vol 117 (2019), pp. 210-220 [10.1016/j.ymssp.2018.07.011] [abs]. Hong, D; Yang, S; Zhang, Y; Huang, WF; Liu, QH, Pseudoanalytical formulations for modeling the effect of an insulating layer in electromagnetic well logging, Ieee Transactions on Geoscience and Remote Sensing, vol 56 no. 12 (2018), pp. 7022-7029 [10.1109/TGRS.2018.2847027] [abs]. Chen, H; Du, Y; Yuan, M; Liu, QH, Analysis of the Grounding for the Substation under Very Fast Transient Using Improved Lossy Thin-Wire Model for FDTD, Ieee Transactions on Electromagnetic Compatibility, vol 60 no. 6 (2018), pp. 1833-1841 [10.1109/TEMC.2018.2807123] [abs]. Ding, X; Zhao, Z; Yang, Y; Nie, Z; Liu, QH, A Compact Unidirectional Ultra-Wideband Circularly Polarized Antenna Based on Crossed Tapered Slot Radiation Elements, Ieee Transactions on Antennas and Propagation, vol 66 no. 12 (2018), pp. 7353-7358 [10.1109/TAP.2018.2867059] [abs]. Ren, Y; Zhao, SW; Chen, Y; Hong, D; Liu, QH, Simulation of low-frequency scattering from penetrable objects in layered medium by current and charge integral equations, Ieee Transactions on Geoscience and Remote Sensing, vol 56 no. 11 (2018), pp. 6537-6546 [10.1109/TGRS.2018.2840145] [abs].